Dutch physician and worker for the emancipation of the Jews; born about the middle of the eighteenth century; died at an advanced age at Amsterdam Dec. 5, 1823. On the completion of his medical studies he was appointed physician for the poor by the parnasim of the Ashkenazic community of Amsterdam (1788). When the French took possession of Holland (1795), Lemon became one of the leaders of the Felix Libertate Society, which aimed at winning civic equality for the Jews (see Amsterdam). The parnasim, who did not approve of this movement, dismissed him from his office (April, 1795). 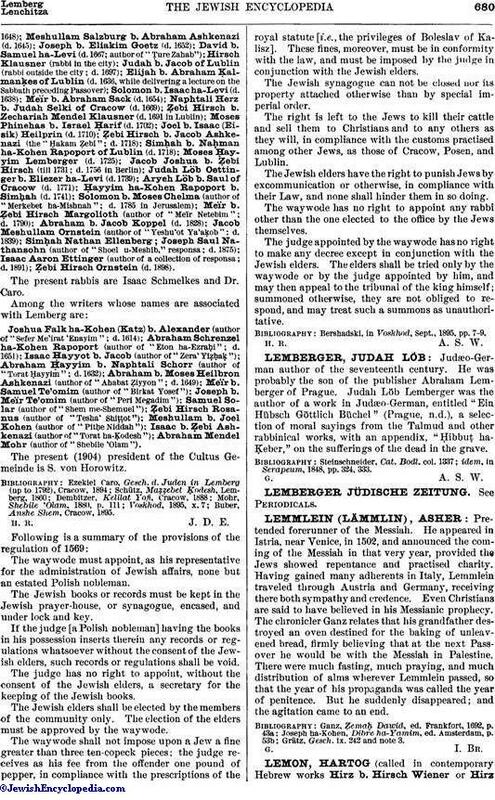 Lemon, however, continued his efforts to procure the emancipation of the Dutch Jews; and he interested himself also in the organization of a new Jewish community at Amsterdam. He was successful in both directions: the Jews of Holland were emancipated on Sept. 2, 1796; and on June 23, 1797, Lemon as president delivered the inaugural address of the synagogue of the new congregation Adath Jeschurun (published Amsterdam, 1797). On Aug. 1, 1797, Lemon, together with S. Bromet, was elected a member of the parliament ("Nationale Conventie"). The Adath Jeschurun also sent him, together with two other members, as delegate to the Great Sanhedrin at Paris, where he delivered two discourses ("Bijdragen Betrekkelijk de Verbetering van den Maatschappelijken Staat der Joden," part i., pp. 471-472, 513-515, The Hague, 1806-7). 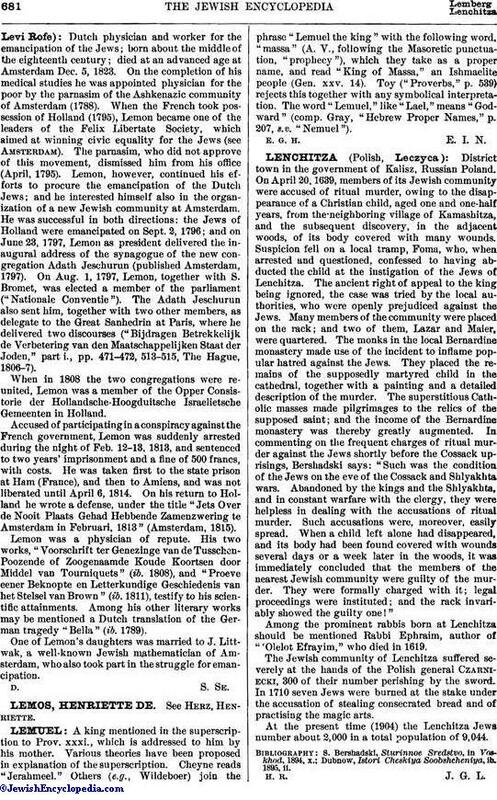 When in 1808 the two congregations were reunited, Lemon was a member of the Opper Consistorie der Hollandsche-Hoogduitsche Israelietsche Gemeenten in Holland. Accused of participating in a conspiracy against the French government, Lemon was suddenly arrested during the night of Feb. 12-13, 1813, and sentenced to two years' imprisonment and a fine of 500 francs, with costs. He was taken first to the state prison at Ham (France), and then to Amiens, and was not liberated until April 6, 1814. On his return to Holland he wrote a defense, under the title "Jets Over de Nooit Plaats Gehad Hebbende Zamenzwering te Amsterdam in Februari, 1813" (Amsterdam, 1815). Lemon was a physician of repute. His two works, "Voorschrift ter Genezinge van de Tusschen-Poozende of Zoogenaamde Koude Koortsen door Middel van Tourniquets" (ib. 1808), and "Proeve eener Beknopte en Letterkundige Geschiedenis van het Stelsel van Brown" (ib. 1811), testify to his scientific attainments. Among his other literary works may be mentioned a Dutch translation of the German tragedy "Bella" (ib. 1789). One of Lemon's daughters was married to J. Littwak, a well-known Jewish mathematician of Amsterdam, who also took part in the struggle for emancipation.